The riparian buffers on our farm on Middle River are now fifteen years old. Fifteen years ago, the “River Farm” was basically a cool-season grass pasture with a few scattered mature trees along the banks of the river. Now, in addition to excellent forage for cattle, there are hundreds of native trees and shrubs and thousands of native plants creating diverse wildlife habitats on the land that provides food for a thriving aquatic ecosystem. This oak tree was planted in 2004. It’s now 8 inches in diameter at breast height in 2018. Fifteen years ago, this forty acre farm was one. big. pasture. The Middle River meanders through it for one-half mile and there are two unnamed, intermittent streams that seep out of the ground and flow to the river. There were no internal fences for the pasture and the cows had access to all the water features including the river. Middle River before cattle were fenced out in 2004 on our farm. Middle River and riparian buffers fifteen years later – 2018, from the same spot as above. Getting the cows from this big pasture to the barn was a chore fraught with frustration. If the cows didn’t want to move they could cross the river, multiple times at any number of their favorite crossings leaving us on the other side cursing wildly and bewildered because there was no way for us to cross the ten feet wide river unless we went back out to the road – outsmarted by bovines. In 2004, we enrolled in USDA’s Conservation Reserve Program. (This gets technical and bureaucratic, so skip these Ps if you don’t need the info). We have two, fifteen-year contracts. One called CP-29 and the other CP-22. The CP-29 contract for 2.0 acres, had a minimum, average setback from hydric features at 20 feet; ideal for a cattleman that desired more pasture and less buffer. At that time USDA did not require us to plant anything within this narrow buffer as long we could find four native species in the area we were fencing off. The CP-22 contract for 3.9 acres, required a minimum setback of 35 feet and 110 hardwood trees per acre. This is the Conservation Reserve Enhancement Program (CREP). We have 5.9 acres of riparian buffer, a half mile on Middle River and 0.12 miles for each of the two intermittent streams. It was a big project creating two alternative livestock watering stations, three stream crossings, 1.5 miles of fence, and a hardwood tree planting. We used the hydric features and fences to create five smaller grazing fields for rotational grazing. Now, fifteen years later, we can get the cows to the barn with ease, the cows drink cleaner water, and we can rest in the shade of the riparian trees. This farm produces not only grass for beef but wildlife, and cleaner water as well. 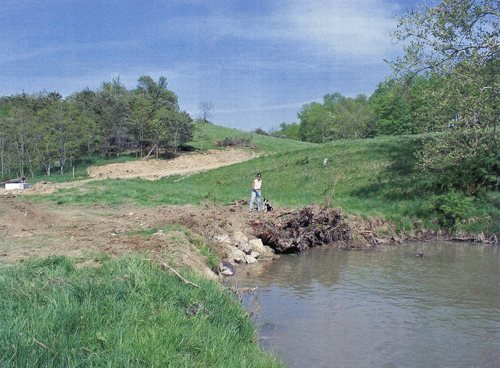 Jeanne and Dexter, 2004, standing on a root wad installation to stabilize a curve in Middle River. Root wad installation twelve years later – 2016. My wife, Jeanne, is a ninth-generation farmer. She knows cattle. I’m an environmentalist, I know soil and water. Together we made this farm into a showcase of how compromise and working together can achieve much more than our individual pursuits. We can indeed farm and improve the environment. 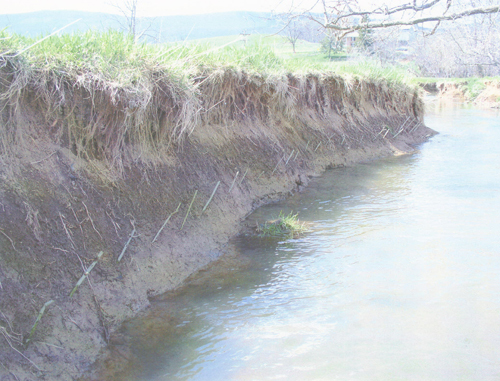 Eroding bank of Middle River on the farm in 2004. Willow live stakes inserted into the bank. Same Middle River bank in 2018. Our two USDA contracts will expire on September 30, 2018. We will not renew the contracts because the CP-29 program doesn’t exist anymore and Virginia offers a program that pays $1/foot of stream exclusion. It’s called the “Continuing Conservation Initiative” and can be found in the Virginia Agricultural BMP Cost-Share Manual. We have learned so much in this short fifteen year period. In the CREP area, tree canopy closure was achieved in just seven years. That’s because we applied management. • Rotational grazing is good for the cows and the pastures. It’s much easier to call cows and lead them than it is to push them to the desired location. In rotational grazing, the grass is greener on the other side so they naturally want to move. • An exclusion fence is a significant insurance against calf mortality. Swamps, steep ravines, and streams are dangerous places for cows to have a newborn calf. Calves that cannot get up because the wet muck sucked their legs in or because it’s too steep to stand up will perish before they can nurse. • Water is the often the limiting factor in creating a rotational grazing system. •,You can’t just plant trees and walk away. Plant the right tree in the right place and maintain the tree shelter. • Keep tall fescue and voles away from the tree. • I wish we had planted more trees and shrubs in the CP-29 area. 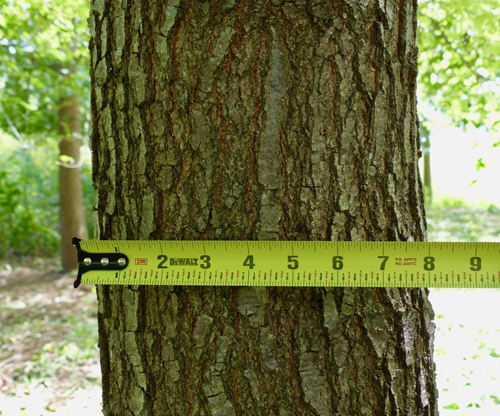 In the CREP area where we planted native hardwoods according to the Virginia Department of Forestry hardwood tree planting guide at the time, the trees are twenty feet tall and many have a diameter greater than six inches at breast height. The forest floor in the CREP is totally shaded. • In the CP-29 CRP area, we did not plant trees like we did in the CREP area. We planted trees and shrubs here and there just about every year with some success. The native pioneer trees, however; did much better. • Native trees will come if you let them. 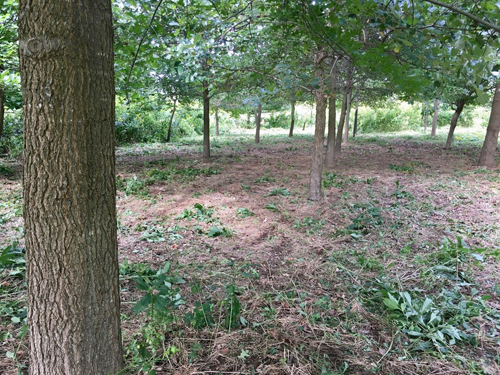 Walnut, Green Ash, Sycamore, and Catalpa are the most prolific in our area. • If you plant a tree, you must help it along. Voles and fescue will try to kill it. Tree shelters work. But, you must maintain the stake and they should be removed when the tree can support itself and, you must put some sort of deer deterrent on it to prevent deer rubs. 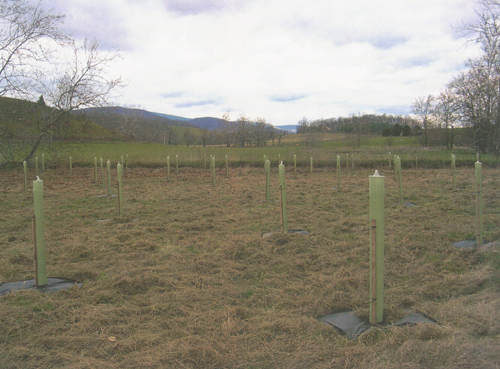 • In 2004 we used the Virginia Department of Forestry’s Hardwood Tree Planting Guide. We followed it and it worked. CREP hardwood tree planting at the river in 2018. • Plant habitat and they will come. Our riparian buffers are so vibrant with wildlife. Willow Flycatchers, Indigo Buntings, Blue Grosbeaks, Warbling Vireos, Monarch butterflies, and so much more come to nest in our riparian buffers. 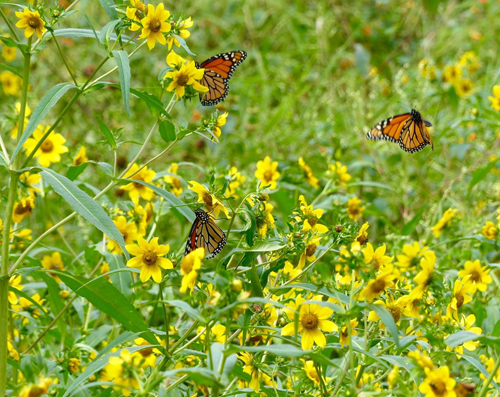 • Wildflowers and native grasses include Jewelweed, boneset, grand lobelia, solidago, wingstem, ironweed, Mexican hat, Maximillion sunflower, common milkweed, butterfly weed, bur marigold, switchgrass, Indiangrass, and big bluestem. Monarch butterflies on bur marigolds in our riparian buffer. 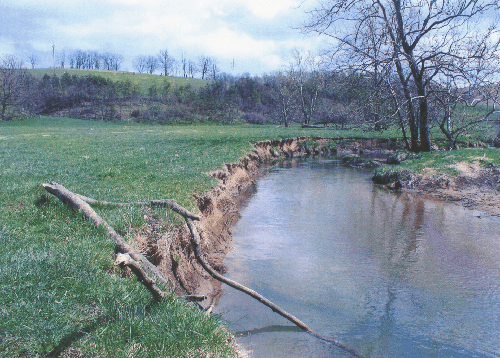 • Removing cattle from the streams and river improved water quality. Most of the stream banks healed on their own and E. coli is reduced on average by 55%. We know this because we sampled the river when it enters the farm and a half mile downstream when it leaves the farm. We sampled the river every month for two years for the Friends of the Middle River. Sample results for all sites can be found on their website. 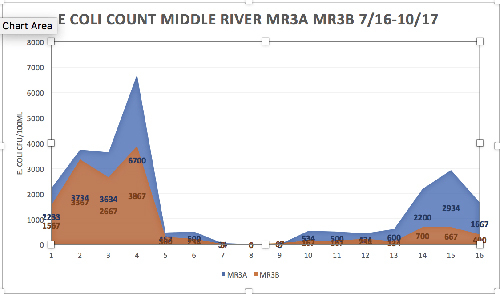 Graph of E. coli counts over a 16 month period for site MR3 and MR4 on Middle River. MR3 is upstream of the farm and MR4 is where the river leaves the farm. • There will always be invasive plants. They are ephemeral in population, first, it was thistle, then teasel, now carpetweed and bur cucumber. 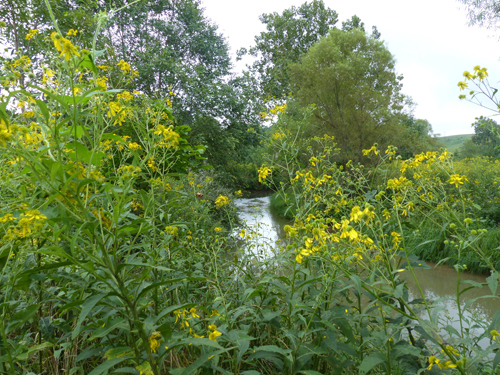 Riparian buffers, especially riparian forest buffers are the single most cost-effective Best Management Practice to improve freshwater streams. This coupled with increased livestock watering stations and internal fencing can greatly improve grazing distribution, ease of herd movement, improve herd health, and reduce calf mortality. 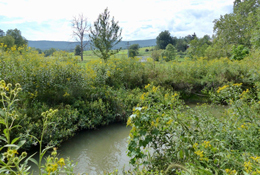 Riparian buffers are a win-win for the farmer and our streams. To learn more or to get help to install this practice on your farm contact me, your local Soil and Water Conservation District, local USDA Service Center or the Chesapeake Bay Foundation. 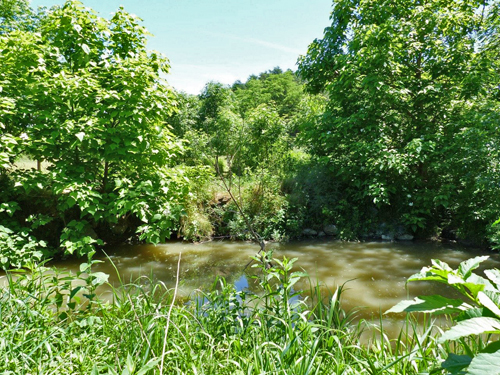 There are many programs and technical assistance to help install more riparian forest buffers.